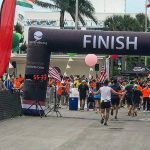 MIAMI, FL – Just over a month prior to hosting The Masters, Augusta, Georgia welcomed a couple thousand participants in the 10th Annual Augusta University Half Marathon, 10K & 5K. Continental Event & Sports Management Group, LLC (CESM), producers of the Divas® Running Series and Myrtle Beach Mini Marathon, produced the event in collaboration with the Augusta Sports Council for the fourth year in a row. This year’s event featured a new route that began on Reynolds Street at Augusta Common and ended on the other side of the park on Broad Street. It was a year of change as the 2018 event was held on a Saturday in order to host all three distances, plus the kids race, in festival-like fashion. Sergei Zyrianov, from Gainesville, FL, was the first overall male in the half marathon finishing with a time of 1 hour, 9 minutes and 21 seconds. The first overall female half marathoner also hailed from Gainesville. Marina Khmelevskaya finished in a time of 1 hour, 23 minutes and 20 seconds. Ryan Gallagher, from North Augusta, SC took first overall in the 10K. He finished in 40 minutes and 53 seconds. Sara Chuzie finished the 10K in a time of 46 minutes and 52 seconds, coming in first overall for females. Local 12-year-old, Charlie Smith was the first female to cross the 5K finish line with a time of 26 minutes and 23 seconds. Ethan Kurilko, finished first overall with a time of 18 minutes and 14 seconds. Ethan bettered his finishing time by over three minutes from his second-place overall finish in the 5K in 2017, when the 5K distance debuted. The top three male and female finishers of the half marathon received a cash prize while the first place male and female finishers in both the 5K and 10K received a free registration for 2019 and a gift card. For the third year in a row, Augusta University sponsored the event. Augusta University is a public research university and medical center dedicated to training the next generation of innovators, leaders and health care providers. Based in Augusta with locations across Georgia, Augusta University is at the forefront of groundbreaking research focused on improving and enriching the human experience. Continental Event & Sports Management would like to thank the Augusta Sports Council for their hard work, dedication and partnership. The Augusta Sports Council enriches the quality of life and economic well-being for the Augusta metropolitan area by supporting and attracting sporting activities such as the ESPN Bassmaster Tournament and the GHSA Boys & Girls State Golf Championships. They also created the Ray Guy Award to recognize the top College Punter of the Year, which is presented annually during The Home Depot College Football Awards. 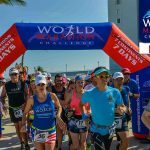 Next year’s race will take place on Saturday, February 23, 2019. Registration is now available on Active.com. Full results are available at https://www.augustahalf.org/awards-results.